It would have been easy to pigeonhole Scottish Falkirk-based Cnoc An Tursa, and in a way the written references I came across thus far sort of put you on a certain thinking path. Heavily praised by Chris Naughton (Winterfylleth), produced by Chris Fielding (Primordial), having gone on tour with Winterfylleth and Wodensthrone, bearing a distinct Scottish name for a moniker – everything almost speaks to a certainty that Cnoc An Tursa is destined to follow the path of many other British based pagan folk black metal bands. In fact, the biosheet says so, yet my ears hear a different twist on The Giants of Auld. There is no question that after acoustic intro The Piper O'Dundee – the proverbial calm before the storm – the band launches into a distinctly Scottish Highlands leading riff on The Lion of Scotland. 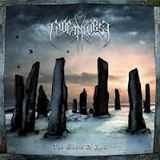 At the same time the Scottish melody only accentuates what the band relies upon, a dense noisy busy wall of guitars, not unlike what early Gothenburg progenitors Dark Tranquillity and In Flames relied upon in their formative years of Skydancer and Lunar Strain. Songs like Ettrick Forest in November ring definite references for me. The blasting on The Giants of Auld is rare, and when it is there it is slower than what you would get in a more familiar ambient folk black metal setting. Instead, Cnoc An Tursa offers a steady dose of double bass serving as a center axis around which many of their riffs rotate. Another rather prominent feature of the band is the presence of keyboards, very notable, yet never usurping the lead role, or competing against the aforementioned guitar wall. For Cnoc An Tursa keyboards are a source of reflection, the way to provide for a longing opening on Hail Land of My Fathers, for heroic soaring on Winter - A Dirge or astral travel on Culloden Moor. The use of keyboard in their quasi melodic death metal and the tortured coals-in-his-throat vocals by Alan Buchan actually provide hints of another Swedish reference, Lothlorien, the weeping over-distorted vocals injecting that unmistakably dejected feeling in the music. At times Cnoc An Tursa sounds a bit more modern, a bit more Damage Done (In Shadowland), and I rather hope they do not give in too much to that template. There is enough of it on The Giants of Auld as is, the band does not need to become another Insomnium, with more prominent keyboards. When Cnoc An Tursa goes for an atmospheric dreamy breather (The Lion of Scotland, Hail Land of My Fathers, Culloden Moor) they immediately gain uniqueness, just like they do walking a little slower walk of a tired warrior on The Spellbound Knight or expressing the epic feeling of triumph on Bannokburn. The foundation on The Giants of Auld is strong, and the authentic flavor is presented well, but in my humble opinion the Scotts would benefit more of what those biosheets and references claim them to be.